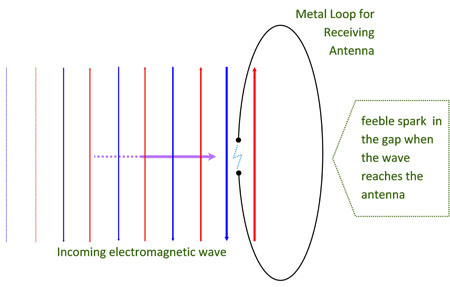 Electromagnetic Waves come in many varieties, including radio waves, from the ‘long-wave’ band through VHF, UHF and beyond; microwaves; infrared, visible and ultraviolet light; X-rays, gamma rays etc. What difference did it make? Maxwell’s new law and Faraday’s law couple together as a wave equation, implying that any disturbance in the electric and magnetic fields will travel out together in space at the speed of light as an ‘electro-magnetic’ wave. What happened next? In 1887 Heinrich Hertz used a spark-gap transmitter and receiver to demonstrate that these waves actually existed. The spark generator causes a current spike across the gap in the central antenna. The transient pulse of electric field travels outwards at the speed of light. It alternates in direction (red for up, blue for down) making a wave, and carries with it a magnetic field and electromagnetic energy. 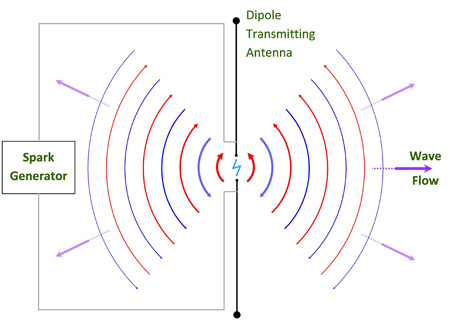 The electromagnetic wave disturbs the electric field at any point through which it passes. It therefore moves the charges in the metal loop, causing a current. Significant currents can create a large enough voltage at the gap to cause a spark, indicating the presence of the electromagnetic wave. 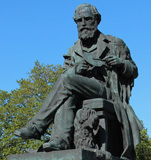 1885 - Oliver Heaviside reduces Maxwell’s original equations into the form used today. 1897 - Guglielmo Marconi employs electromagnetic waves for radio communications. 1905 - Albert Einstein uses Maxwell’s equations to a start his theory of special relativity. 1920 - households begin listening to music and voice broadcast on crystal and valve radios. 1957 - Sony begins mass producing affordable portable transistor radios. 1973 - First hand-held or personal cellular mobile telephone networks. 2000 - WiFi expands connectivity of mobile devices to the internet. 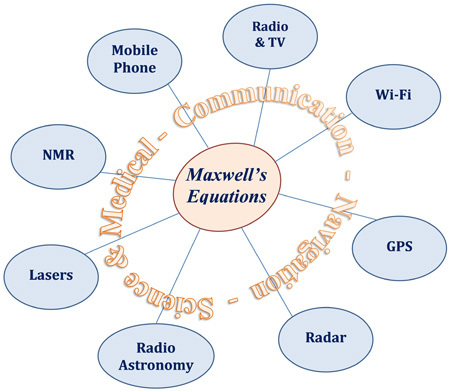 Some Key Applications that Depend on Maxwell’s Equations and Electromagnetic Waves.